Piriformis pain from injury is a common consequence of direct or indirect trauma to the piriformis muscle or any of its attaching tendons. Although the piriformis is not a muscle that is overly susceptible to injury, damage can be incurred by specific forms of trauma to the region and often affects one or more of the other lateral rotators of the hip. Injury can be an acute occurrence as a result of known or unknown circumstances. Injury can also occur due to accumulated stresses that tend to build-up and create a chronic syndrome known as RSI or repetitive strain disorder. Other types of painful conditions do not involve injury to the piriformis directly, but might involve injury to another tissue that influences the functionality of the piriformis muscle. This is commonly seen in muscular imbalances where a tissue is damaged and therefore affects the balance of the antagonistic pairing with one or more of the lateral hip rotators. This article explores the occurrence of piriformis pain due to direct or indirect injury. The piriformis muscle is strong and well protected. However, it is not immune to suffering trauma from any severe stress, including those caused by athletic endeavors, falls, car accidents and other mishaps. Since the leg tends to act as a lever, stress can be exponentially magnified on the hip and soft tissues of the region when violent force is applied. In rare cases, one or more of the attaching tendons might become detached from its anatomical connections. This type of injury is more significant and might require surgical reattachment of the torn soft tissue. 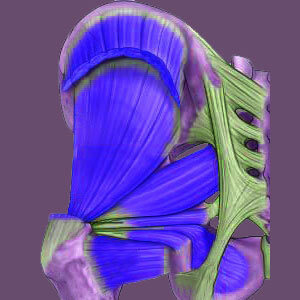 When injured, the piriformis can produce pain just like any other anatomical structure. This pain might be minor or severe, but is likely to be linked to mobilization of the affected leg and weight bearing on the symptomatic side. In some cases, injury can cause the piriformis muscle to spasm, possibly also creating piriformis syndrome, which is a diagnosis describing compression of the sciatic and/or pudendal nerves by the cramping muscle. Indirect injury can also affect the piriformis in various ways, inciting pain. Since the muscles of the region work as a team and are balanced by numerous other antagonistic tissues, injury to any single structure can have a wide-ranging cascade effect on the entire regional anatomy. Muscle imbalances can affect numerous tissues in the region and might influence the functionality of the piriformis, possible creating hypertension or hyperlaxity in the muscle. These conditions can cause functional issues and pain and might also begin the onset of piriformis syndrome, as noted above. Likewise, injury to the spinal nerve roots at S1 and/or S2 might influence the piriformis, since these are the roots that innervate the muscle. These are also 2 of the key roots that form the sciatic nerve. Ironically, dysfunction of the nerve roots at the spinal levels due to compression might cause pain and dysfunction in the piriformis, including muscular spasms. Subsequently, the muscle contracts and places even more stress on the fully formed sciatica nerve, escalating symptoms through multiplication of mechanism of action, potentially sourcing very severe sciatica and pseudo-sciatica simultaneously. Injury is a very subjective term that can include many causative processes. Trauma is just one of many possible forms of injury, with others including tissue degeneration, aging, and various functional consequences of anatomical changes in related and interdependent anatomical components, including other muscles, tendons and even major joints. Many patients are diagnosed with piriformis injury, despite having no memory of hurting themselves. Be wary of such diagnoses, since many scenarios entail normal degenerative and structural changes or slight anatomical irregularities that are certainly not pathological. Remember also that virtually all forms of injury will heal organically and in a relatively short time span. The body is primarily designed with the imperative to heal and most traumas will resolved within a matter of 4 to 8 weeks, with pain only being significant for a fraction of this limited time frame.